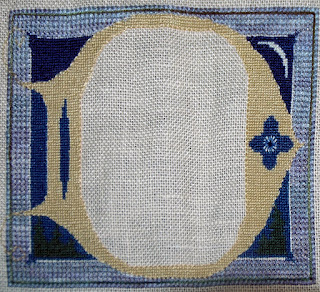 I have finished the outer part of the initial. It was a bit easier once I finished the border. The blue in the upper, middle and lower parts of the initial are done with Anchor 134, 133, and 132. Although the DMC equivalents were given, I chose to stitch it with the Anchor colors. The blue is graduated from dark to light so subtly, that I decided not to try to match the colors. This is a somewhat pricey piece. There are many Anchor threads called for, as well as I think, 7 different shades of Silk 'n Colors, plus the metallic threads, gold purl and the gold and silver paillettes. 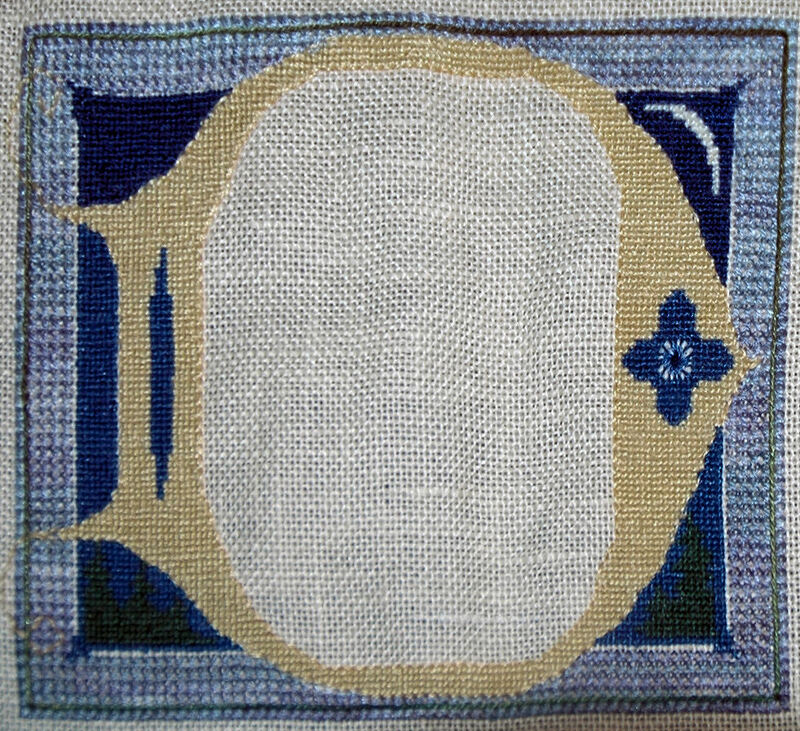 Most of the initial is stitched one over one, but the border is cross stitched over two threads with Periwinkle Silk 'n Colors. The outermost row is stitched with two threads. The rest is all done with a single thread. 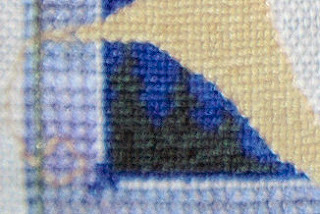 In between the last row, there is a stem stitch done all around in Camouflage Silk 'n Colors. It is the dark line going all around. This color ranges from bright green to brown. I wasn't too sure how it would look because I kept getting a lot of dark brown, but I think it turned out ok. It is hard to see it from the picture, but the lower part of the initial features evergreen trees against the blue, on both sides. This pictures also shows the tails (ornamentation) coming off the initial. I am not thrilled with the way they came out, It is very hard to see them.They seem to disappear into the threads. It is supposed to be back-stitched with a single thread, but I think I may try it with two threads to see if it looks better. That's where I am now. The next step is to fill in the center of the initial, starting with some grass at the bottom. Hope everyone is managing to stay cool in this weather. I am so done with summer! I am not a fan of the hot weather, and this summer is just relentless with the heat! I am looking forward to fall, my favorite season! Wow, this definitely looks labor intensive! Very pretty too! It's really looking great with all the details that are in the design. A great project! Deep Peace is looking gorgeous, great progress. I've done several of Lauren's designs (but not this one) and there's not one that hasn't had me contemplating tearing my hair out at some point but they are stunning when they are done. I am not sure I like this background. TUSAL, some groaning, and a small finish!